For the DDR, a substantial portion of the commemorative stamps of 1951 celebrate new national relationships, primarily with other Eastern European and Asian communist nations. Stamp issues for annual sporting, commercial, and special events were also continued during 1951 and 1952. The two stamps shown above (Mi. #280-81, Sc. 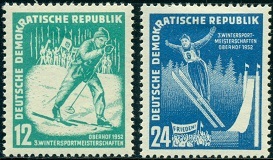 #76-77) were issued on February 3, 1951 to publicize the Second Winter Sports Championship Matches in Oberhof. The two designs feature tobogganing and ski jumping. 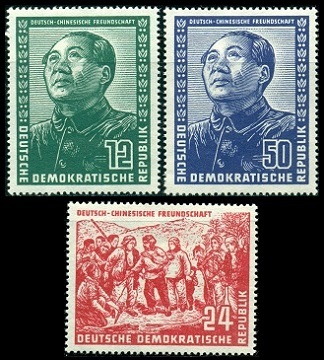 The two DDR pictorial stamps shown above (Mi. #282-83, Sc. #78-79) were issued on March 4, 1951 to publicize the Leipzig Fair. The two large-sized stamps shown above (Mi. #284-285, Sc. #80-81) were issued on April 22, 1951 to celebrate German-Polish Friendship and the Visit of Polish President Boleslaw Bierut to the German Democratic Republic. The designs feature German Democratic Republic President Wilhelm Pieck (1876-1960) and Republic of Poland President Boleslaw Bierut (1892-1956). In the background is a Dove of Peace and the Oder-Neisse Line, the demarcation point between the German Democratic Republic and the Republic of Poland. The three large-sized stamps shown above (Mi. #286-88, Sc. #82-84) were issued on June 27, 1951 to celebrate German-Chinese Friendship. The design of the two vertical-format stamps features the likeness of Mao Zedong (1893-1976), the founding father and leader of the People's Republic of China. The design of the horizontal-format stamp features "The Redistribution of Chinese Land", from a propaganda poster by Niu Wen. 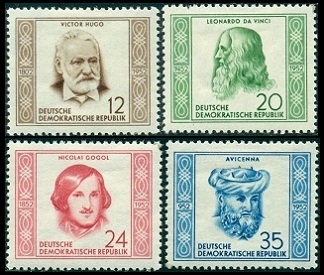 The four DDR stamps shown above (Mi. #289-92, Sc. #85-88) were issued on August 3, 1951 to publicize the 3rd World Youth Festival for Peace, held in Berlin. The two designs feature a boy raising a flag and girls dancing. The two large-sized stamps shown above (Mi. #296-97, Sc. 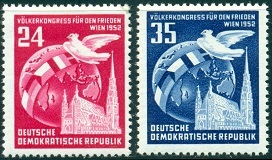 #92-93) were issued in December 1951 to celebrate German-Soviet Friendship. The design of the 12 Pf. denomination stamp features portraits of Pavel Bykov and Erich Wirth. The 24 Pf. denomination features portraits of Joseph Stalin (1878-1953) and Wilhelm Pieck (1876-1960). The two stamps shown above (Mi. #298-99, Sc. #94-95) were issued on January 12, 1952 to publicize the Third Winter Sports Championship Matches in Oberhof. The two designs feature skiing and ski jumping. The two stamps shown above (Mi. #300-01, Sc. 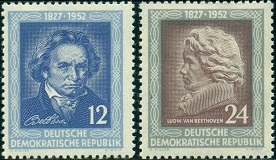 #96-97) were issued on March 26, 1952 to commemorate the 125th Anniversary of the Death of Ludwig van Beethoven (1770-1827). The four surtaxed pictorial DDR stamps shown above (Mi. #303-06, Sc. #B22-25) were issued on May 1, 1952 to publicize and raise funds for the National Reconstruction Program. 12 Pf. + 03 Pf. - Clearing land. 24 Pf. + 06 Pf. - Bricklaying. 30 Pf. + 10 Pf. - Carpentry. 50 Pf. + 10 Pf. - Inspecting reconstruction plans. The three stamps shown above (Mi. #308-10, Sc. #100-02) were issued on July 5, 1952 to honor Famous Composers. 06 Pf. - George Friedrich Handel (1685-1759). 08 Pf. - Albert Lortzing (1801-1851). 50 Pf. - Carl von Weber (1786-1826). The four stamps shown above (Mi. #311-14, Sc. #103-06) were issued on August 11, 1952 to honor Famous People. 12 Pf. - Victor Hugo (1802-1885), French poet and novelist. 20 Pf. - Leonardo da Vinci (1452-1519), Italian painter, sculptor, architect, engineer, and inventor. 24 Pf. - Nikolai Gogol (1809-1852), Russian novelist. 35 Pf. - Avicenna (980-1037), Persian philosopher. 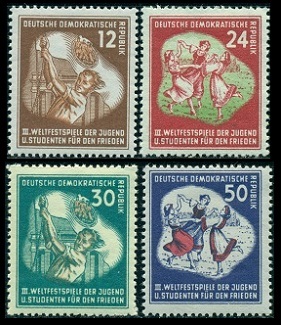 The two DDR pictorial stamps shown above (Mi. #315-16, Sc. #108-09) were issued on September 7, 1952 to publicize the Leipzig Fair. The two stamps shown above (Mi. #320-21, Sc. #118-119) were issued on December 8, 1952 to publicize the Congress of Nations for Peace, held in Vienna, Austria from December 12 through December 19, 1952. The design features a globe, dove, and St. Stephen's Cathedral. The 24 Pf. denomination stamp shown above (Mi. #293, Sc. 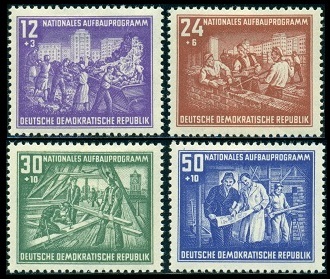 #89) was issued on September 2, 1951 to celebrate the First Five Year Plan of the German Democratic Republic. The 24 Pf. denomination stamp shown above (Mi. #294, Sc. #90) was issued on October 7, 1951 to celebrate the 80th Anniversary of the Birth of Karl Liebknecht (1871-1919), communist activist and politician. The 12 Pf. denomination stamp shown above (Mi. #295, Sc. #91) was issued on October 28, 1951 for Stamp Day. The design features a father showing his children his stamp collection. The 24 Pf. denomination stamp shown above (Mi. #302, Sc. #99) was issued on May 1, 1952 to celebrate the visit of Klement Gottwald (1896-1953), the President of the Republic of Czechoslovakia, to the German Democratic Republic. The 12 Pf. denomination stamp shown above (Mi. #307, Sc. #98) was issued on May 5, 1952 to publicize the Warsaw-Berlin-Prague 5th International Bicycle Peace Race. The 12 Pf. denomination stamp shown above (Mi. #317, Sc. #110) was issued on October 15, 1952 to commemorate the 100th Anniversary of the Death of Friedrich Ludwig Jahn (1778-1852), a politician that introduced gymnastics to Germany. The 24 Pf. denomination stamp shown above (Mi. #318, Sc. #111) was issued on October 18, 1952 to celebrate the 450th Anniversary of the Founding of Halle University in Wittenberg. The 24 Pf. denomination stamp shown above (Mi. #319, Sc. #112) was issued on October 26, 1952 for Stamp Day.